It’s a pain to have to change an Amazon URL to make it work in a different country. Several link shortening services offer a single link which will take the user to Amazon’s site in their country. SmartURL seems the pick of the bunch for authors. A single, easy-to-remember link to your book at Amazon which works in all countries. Earn an extra 9% from Amazon by adding affiliate codes. Change the link easily, for example if your free book is taken out of ‘price matched’ in one country you can direct readers to a site where they can get it free. Experiment with different keywords – even having different keywords for each country. Works with iTunes and others too! 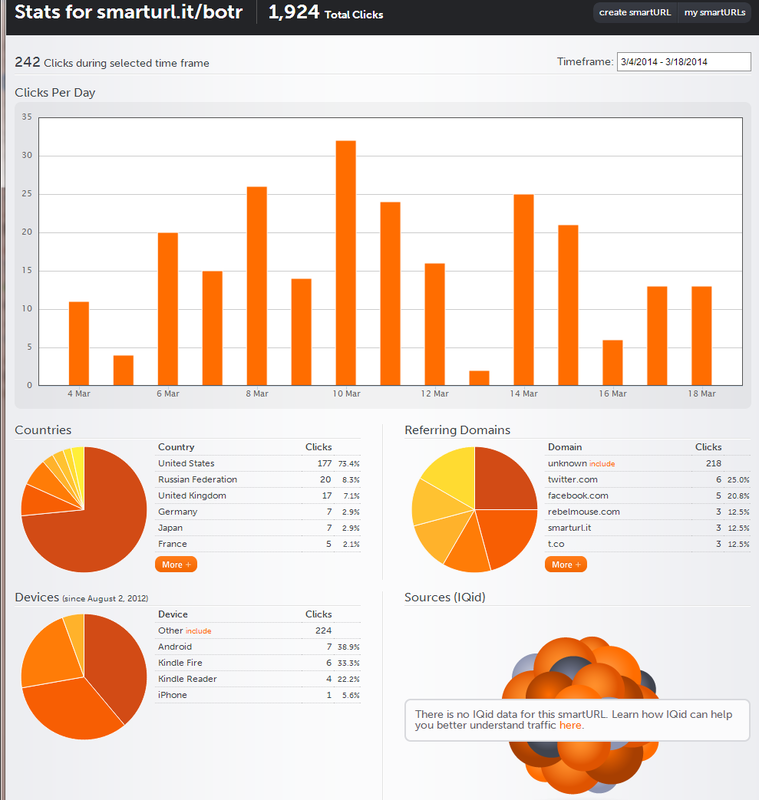 Track clicks on your links. You can even get a QL code. 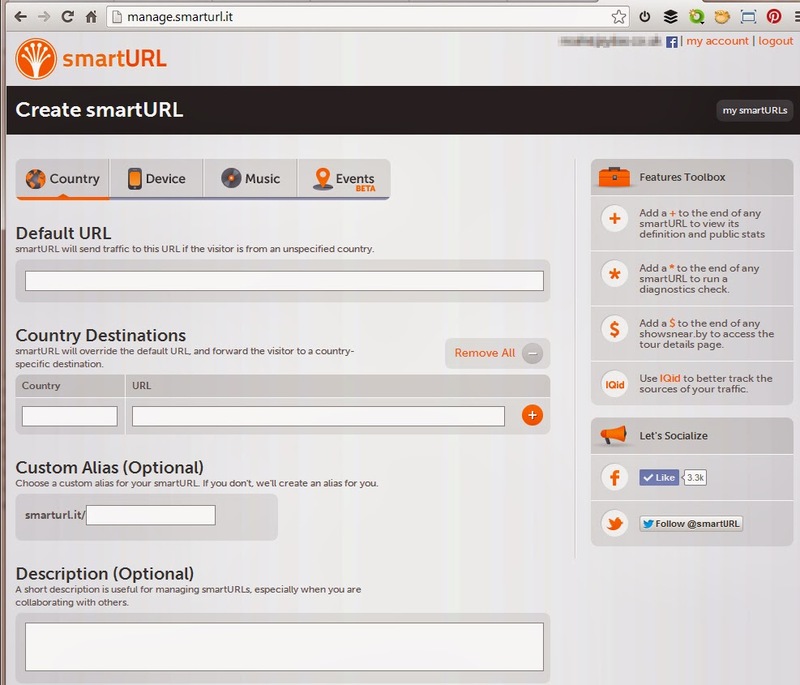 Smarturl.it is a link shortening service which is very effective for producing a single link which takes the reader directly to the Amazon site in their country. It allows authors to add affiliate links and keywords to the link. You can also request a particular, easy to remember link. 2. Amazon affiliate accounts in at least the US, UK and Canada. You can sign up for more if you wish. To get those you’ll need to have a website or blog with enough traffic to make it attractive to Amazon. Don’t worry if they don’t accept you as an affiliate yet but you’ll miss out on the extra 9% offered in affiliate payments. Michael Alvear http://smarturl.it/mak Let me warn you though – although you can learn valuable stuff from this book, I don’t agree with Michael that we are wasting our time promoting using social media. Getting the keywords right will help your book sales but it’s more effective if you use social media as well. Let me show you how I made the link to the book I just told you about. In a different tab go amazon.com and find the book or product you want to link to. I suggest you enter the book ASIN and the keywords you want to use in Amazon’s search box. Don’t forget to add the author name as keywords too. Notice I didn’t use any commas to separate them. You could probably edit out keywords such as ‘a’ and ‘on’ but it isn’t worth the bother. Remember – only add an affiliate tag to books which are NOT free. Amazon don’t like you using tags for free products and may penalise you. Now you need to get the URL for Amazon UK and Amazon Canada and add affiliate tags if you have them. You can either go through the whole process again or just modify the amazon.com link in your text editor. I find it’s easier to modify the link since all you have to do is change ‘.com’ to ‘.co.uk’ for the UK and ‘.ca’ for Canada. You’ll need to change the affiliate tags too. Once you have the URLs enter them in the section ‘Country Destinations’. You’ll need the country code for the ‘Country’ box. For the UK it’s GB and for Canada it’s CA Click the + to add more alternative countries. If you don’t know the code just type in the name of the country. Add as many as you like/have affiliate codes for. Any you don’t add will be added automatically from your default URL by smartURL but they’ll use their own affiliate codes – this is how they make the money to run the site. Now add a custom alias to the link. I add a three letter one. In the case of the book above I used ‘mak’ (from Make a Killing…). Not all of these are available so if someone already has that – try another. Don’t forget the URLs are case sensitive so ‘mak’ is different to MAK, MaK and Mak. Add a description of the link if you wish. This helps you remember what it is when you come back to it. Once you are happy with everything click ‘Save’ and start using your new link. What’s that bit about tracking clicks? just eleven clicks happened at Twitter and Facebook – that’s 4.5% – maybe Michael is right after all? What do you think? What went wrong on Wednesday 5th March and Thursday 13th March? Do you know of a similar free service which offers more? I don’t. The only downside I find in using it is that like all link shorteners it can be abused and sometimes gets an orange circle from Web of Trust. ← An Agent Rejected Your Submission?